In Hear This, A.V. Club writers sing the praises of songs they know well—some inspired by a weekly theme and some not, but always songs worth hearing. This week: songs from 1993. It struck me as odd, even in these instantly nostalgic times, that The Breeders would play human jukeboxes on the occasion of Last Splash’s 20th anniversary. 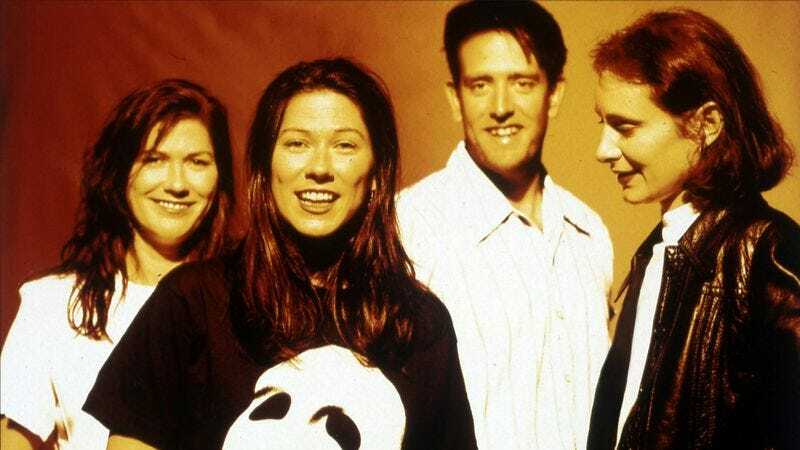 The “one album, end to end” trend appeared to be a big joke to lead Breeder Kim Deal when she and her off-again/on-again/off-again bandmates in the Pixies took Doolittle out on the road a few years back. At that tour’s Austin stop, I recall Deal cracking wise about when it was time to turn the record over—self-consciously mechanical banter accompanied by video of a vinyl copy of Doolittle being flipped. Whatever the truth of those statements, it didn’t come off as an experience anyone involved wanted to repeat. Even if I’m incorrectly interpreting those remarks, Last Splash is an unexpected candidate for live re-creation. It’s massively eclectic, as much an artifact of the CD era as any other album released in 1993—five of its 15 tracks don’t pass the two-minute mark. The freedom of the format allowed the band to flit from style to style—an attractive quality for any listener who can accept the sugary rush of “Divine Hammer” existing on the same disc as the shoegazing swoon of “Invisible Man.” Judging by two decades of used-CD bins, however, that ended up being a turnoff for the post-Nevermind Johnny-come-latelys who picked up Last Splash because they’d heard about the Pixies from Kurt Cobain, then sold the CD back upon discovering that it didn’t contain 15 variations on the tracks that were played on Alternative Nation. To offer an almost-but-not-quite parallel: Imagine R.E.M. getting back together, putting out a couple of solid comeback albums, then devoting the last six months of 2014 to nightly reenactments of Monster. But if there’s anything proven by Last Splash, the unwanted plastic discs that contained it, and the tour it eventually inspired, it’s the virtues of patience. Without the album’s splatter-paint sequencing, it’d be without its winsome final act: a cover of “Drivin’ On 9,” a jangly number originally recorded by Deal’s old Boston-area colleagues in Ed’s Redeeming Qualities. (Ed’s violinist Carrie Bradley reprised her solo for the Last Splash version.) It’s tracks like “Drivin’ On 9” that give records like Last Splash a long tail: Surprises become old favorites; weird little ballads of longing the sneak up on listeners who only know “Cannonball.” I ended up seeing The Breeders play Last Splash twice this year, and “Drivin’ On 9” was a highlight both times. The strangeness of the band immediately transitioning into the requisite reprise of “Roi” never dissipated, but that’s just part of the deal. You want your modern-rock radio hit, you have to pay for the college-rock detours; you want your sweet little country ditty, you have to accept the blast of distorted churning and unintelligible lyrics that follows it.